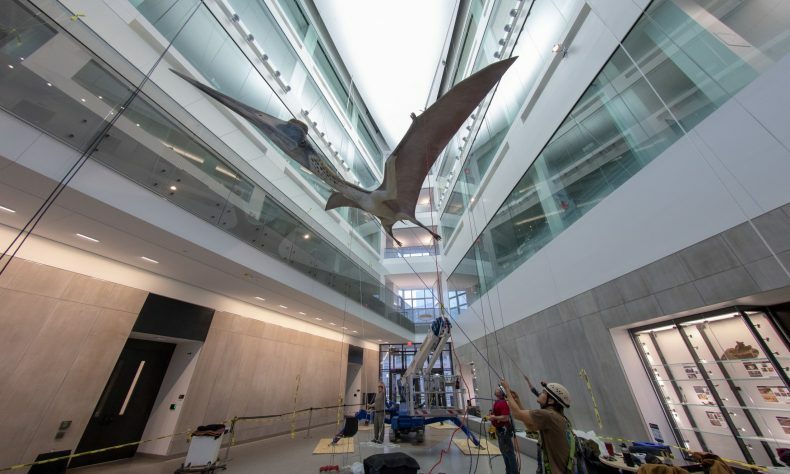 ANN ARBOR — In preparation for the reopening of the University of Michigan Museum of Natural History next spring, a life-size model of a giant, prehistoric pterosaur was installed in a five-story atrium at the university’s new Biological Sciences Building this week. Pterosaurs are often called flying reptiles and were relatives of dinosaurs and crocodiles. The new UM reconstruction is of a pterosaur called Quetzalcoatlus northropi, the largest known flying animal that ever lived. These winged creatures lived about 67 million years ago, shortly before an asteroid collision wiped out most of the life on Earth, including all the flying pterosaurs. 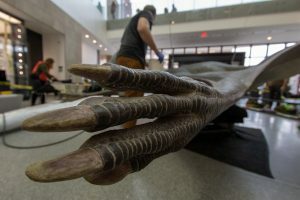 You wouldn’t want to be on the business end of these claws on the life-size Quetzalcoatlus northropi model, installed this week at in the UM Biological Science Building. Photo by Roger Hart/Michigan Photography. Quetzalcoatlus pterosaurs are members of the group Azhdarchidae, animals with small bodies, large wings, long necks and big heads. Quetzalcoatlus northropi is from Texas, but close relatives are found around the world. Fossils of two related species were recently discovered in Jordan. One of those creatures was about the same size as Q. northropi, and the other is a new species currently being described by UM paleontologists. 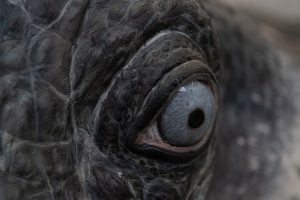 Closeup of one of the eyes on the Quetzalcoatlus northropi model, which will be on display in the UM Museum of Natural History. The museum is scheduled to reopen in its new home, the Biological Sciences Building, next spring. Photo by Roger Hart/Michigan Photography. The Q. northropi reconstruction was designed and sculpted by Blue Rhino Studio of Eagan, Minn., based on some of the latest scientific interpretations of Azhdarchid anatomy and biology. It is a hand-painted fiberglass cast with an internal steel armature for hanging. It has a 35-foot wingspan and is 25 feet long from beak to toe. The 700-pound model was raised three stories into the air by fossil-installation experts from Research Casting International of Toronto. The museum’s Quetzalcoatlus-in-flight model is displayed in the west atrium of the Biological Sciences Building, which includes classrooms and research labs. The Quetzalcoatlus exhibit was made possible, in part, through the generosity of Saroj and Jagdish Janveja, and Robin and Douglas Richstone. The UM Museum of Natural History reopens to the public in April 2019, with additional exhibits opening in November. It is located in the Biological Sciences Building, which serves as a hub of scientific innovation and will give the public an opportunity to discover science in action. 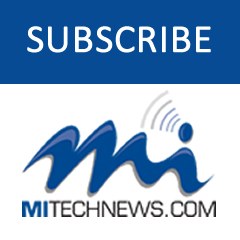 More about the museum’s plans at https://lsa.umich.edu/ummnh.